With Spring in full swing, it's time to start thinking about the prospective graduate in your life. Which one of you is more proud about your student's accomplishments! How exciting it is for them to finally be reaching that seemingly unreachable goal whether it be moving on to high school, to getting their high school diploma or receiving a college degree. No matter the graduation level, moving on is a life-changing event and something to be remembered forever. How are you going to make the event memorable? Spectrum Printing Company can help with beautifully produced custom event announcements. Add an embossed or foil finish for even more elegance. An emboss adds some dimension and texture to the piece and foil finishes add an little extra shine. Foils are available in a variety of different colors that make your invitation distinct. To complete the package we can design and produce beautiful envelopes to hold those event announcements. You can also add save the date cards. These cards can let everyone that you love and care for, about that all-important graduation that is coming up. We can also create custom designs for all of those invitational items for your event. So if you have an idea we can help you make it come to life! After the event, download all the photographs, select the best ones, and have us create beautiful, hard-cover photo books for you and your family to share. Perfect for family members and special friends who could not attend the ceremony in person. 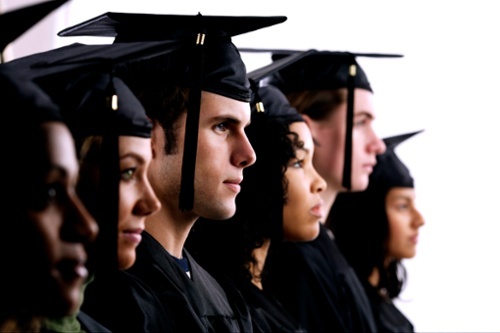 Whatever your graduation EVENT PRINTING AND MAILING needs, let Spectrum Printing Company be the ones to help you. CONTACT US or any of our friendly team members at (520) 571-1114.